Fast, healthy food is one of those concepts that just seems too good to be true. But Farmer’s Fridge, a Chicago-based startup that recently closed a $30 million Series C round led by former Google CEO Eric Schmidt’s Innovation Endeavors, aims to make that a reality. Farmer’s Fridge retrofits vending machines to serve up healthy foods — salads, sandwiches, granola, etc. — for people on the go, for anywhere from $5 to about $8. In order to ensure restaurant-quality food, Farmer’s Fridge has a chef on board who receives feedback from customers to constantly tweak the menu and the food. There’s also a large workforce in place to restock the food, which is prepared daily in Farmer’s Fridge’s kitchen, every morning. I tried the food while I was in Chicago, and I must admit that it was good. And this is coming from someone who generally dislikes salad. While the amount of waste is low (about 5 percent left over) — thanks to its allocation algorithm that determines how much of each type of food to stock in each vending machine location — Farmer’s Fridge has a system in place to deliver leftover food to the Greater Chicago Food Depository, a food bank that works in partnership with 700 agencies, including soup kitchens, shelters and pantries. “The hypothesis for the business is that it’s been done for ATMs, it’s been done for movies, and those things have nothing to do with each other. 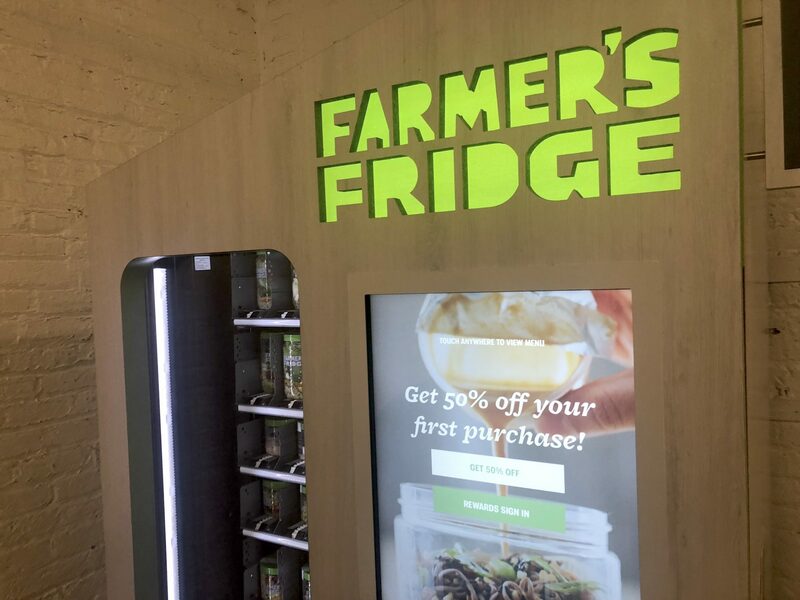 So the only connection would be that consumers generally want things that are faster and cheaper and more convenient, as long as they don’t have to sacrifice any quality from the experience,” Farmer’s Fridge founder and CEO Luke Saunders told me at the startup’s headquarters in Chicago. So far, it’s been working. Since launching in 2013, Farmer’s Fridge has deployed 200 vending machines throughout Chicago and Milwaukee. Farmer’s Fridge vending machines can be found in airports, hospitals and in traditional retailers, like pharmacies, convenience stores and even the Amazon Go store in Chicago. Each location gets stocked at least five days a week, while the airport gets stocked seven days a week. Depending on the business partner, Farmer’s Fridge has a revenue model that ranges from subsidized accounts to revenue shares. The app is probably the least technologically interesting part about Farmer’s Fridge, but what it offers is an easy way to see where you can find a fridge, the inventory of said fridge and the ability to reserve food from that fridge ahead of time. The fridge itself is the real technological achievement. It’s an internet-connected device that runs firmware and features a graphical user interface and cloud infrastructure. Next year, the plan is to expand regionally and launch in an additional region. In the nearer term, Farmer’s Fridge is expecting to grow from 130 employees today to about 200 by the end of next year.